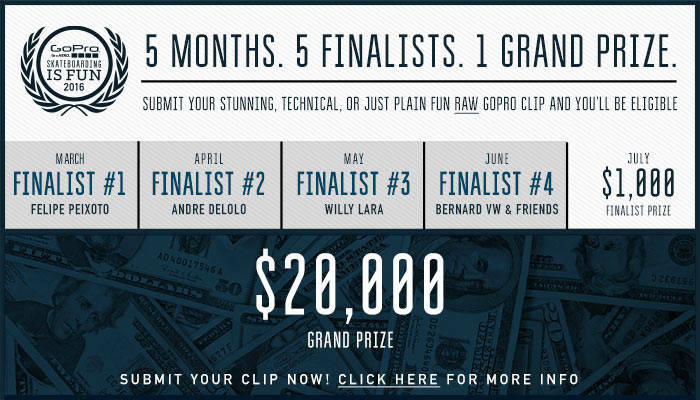 How did you hear about our Skateboarding Is Fun Contest with GoPro? I first saw the Skateboarding Is Fun contest scrolling through the homepage of The Berrics last year. I thought it was a sick contest but I didn’t have a GoPro to submit anything at the time. Luckily, my girlfriend bought me one. How did you arrive at your idea for your submission? I got the inspiration from Majer Crew’s party line–last year’s winners. I thought their video was awesome, I wanted to get one going with our own spin to it. What was the process behind your submission? It was somewhat planned I must admit. I mean, I saw the contest was running again so I created a group chat with the Pharmacy team, shot over some links and ideas, got everyone on the same page, and scheduled a date for all of us to meet up. When we got to Craig Ranch Skatepark, some of us were skating and some of us were still talking over what to skate. Genesis was practicing his backtails down the 4 block rail. He was landing them back to back to back. We stopped talking shortly after we noticed that. We picked out obstacles for everyone else to skate in a line and just went for it. We ended up getting all the way to the end second try. Getting so close so quickly got us amped to keep going. Corey was doing nollie 180 at first and thought his trick wasn’t difficult enough so he randomly just did a switch hardflip first try on one of the attempts then stuck with it. I guess that was a spur of the moment. Carrying a whole outfit while skating and doing the bottle flip spurred up while we were trying also. Genesis randomly started picking up his stuff during the attempts and Destin had to bottle flip at the end to spice it up [laughs]. That was definitely a major highlight. It only took us 15-20 minutes to get it after we started trying. We were all so stoked. How do you believe your submission shows Skateboarding Is Fun? Our video shows how much fun you can have skateboarding with your friends and the excitement it generates. At the end of the video everyone starts wildin’ out for a minute, then Destin bottle flips and it gets even crazier. I believe it shows some of the potential fun you can have with skaters from all different backgrounds and the great friendships you can create through skateboarding and having fun. How did you feel about your chances of winning? We were content with making a fun video that would hopefully get reposted and get some exposure, but we also thought we’d have a good chance at winning with it before and after the video was made. There were over 400 positive comments on Metro Skateboarding’s repost. Plenty of people liked it and left some rad feedback. People were hyped on the filming and the entirety of the video, so I thought we had a good chance. All the other entries were great as well though so I guess we’ll just wait and find out. What’s your favorite part about filming with a GoPro? It doesn’t hurt my back, [laughs]. The GoPro stick makes filming low perspectives a lot easier. Filming our submission would’ve taken a lot more effort with a different camera. It’s cool how you can take it underwater with the case and you can connect it to your phone right away also. GoPro’s are really convenient. How stoked were you when you won the $1,000? Any plans for spending? I was super stoked to find out we won $1000. That makes $125 for each of us just for getting out of the house and doing something fun. There’s so many things I have to buy like new brakes, oil change, gas. I owe my girlfriend a ring because I lost a bet in a game of pool, [laughs]. I actually broke my GoPro case recently so I have to get another one of those… Rent and bills also. It’ll probably go towards something like that and food, [laughs]. I’m not sure what everyone else will spend it on. I know they’re all pretty stoked on it though. You had a ton of people in your video who laid it down for Las Vegas, was that pretty awesome? Yeah, I’m stoked on the team we have here. Everyone’s so good. We all decided on splitting it evenly if we did end up winning. It would only be fair. I couldn’t do it without them. Teamwork makes the dream work happen. Do you have any advice for anyone thinking about submitting? Just have fun with it. Don’t contemplate submitting too much. It’s pretty much a win–win situation. If you don’t win, you still have a cool video and if you do win, you will get a cash bonus on top of it. There’s nothing really to lose in trying. Just go for it. Will you submit again? Will your approach be the same? It was fun making the last one so I’m definitely down to submit again. Filming another party line would be fun. There were a few guys that didn’t make it last time that still want to do another one. I like party lines because there’s always going to be a huge feel of accomplishment at the end. We might try something different also though. We’ll see. Finally, if you won the $20,000, what would you do with the cash? How would you feel? Would you split it up? If we won the $20,000, we’d all split it down evenly making it $2500 for each person. I’d be super stoked. I’d probably buy what was necessary at the time, but try to save it for the most part and spend it wisely. A few friends in the video had the idea of working on something together with the cash. I think that would be cool. There’s plenty you can do with that much money. It’s difficult to say right away. With a few or so left to submit your best raw GoPro Clips, our last $1,000 monthly winner is still out there… So call up your friends and break out your GoPros for a chance to win $20,000! Somebody has to win… Why not you? SUBMIT NOW!